Various locations in Lewistown and Havana area. 11:00 a.m., 1:00 p.m., & 3:00 p.m. Raptor Awareness with free flight demonstrations. Tickets cannot be reserved in advance, but will be available on a first come, first served basis, beginning at 9:00 a.m. at Dickson Mounds, the day of the event. Seating is limited. Admission is free. 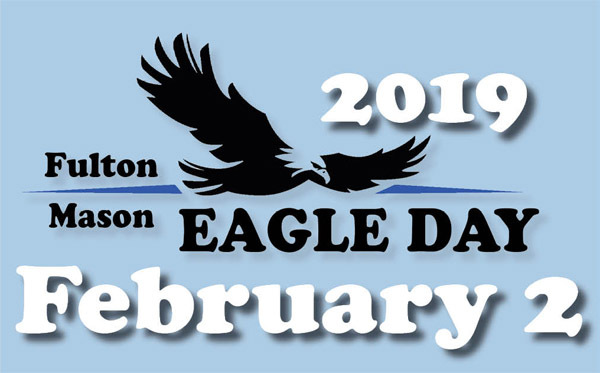 The Nature Conservancy's Emiquon Preserve boat launch parking lot, off of route 97/78, Lewistown, from 9:00 a.m.-3:00 p.m.
*Be sure to visit Big Horse Vineyard and Native Trails Winery after the event for additional Eagle Day specials and activities. U.S. Fish and Wildlife Service-Chautauqua National Wildlife Refuge 19031 E. CR 2110N, Havana, from 9:00 a.m.-3:00 p.m.
Self-guided eagle-watching from the cross-dike at Eagle Bluffs, one mile north of the refuge headquarters. Foot-traffic only. Visitors should use caution and it is not recommended due to the extremely icy conditions. Auto-tour route and road leading to Refuge headquarters is closed due to ice/snow. Food available for purchase courtesy of the Havana Boy Scouts. *Visitors may meet Emi or Emmett the Eagle Mascot at various locations throughout the event. *Kids under 16 years old are encouraged to participate in an Eagle Coloring Contest through January 31st. Sheets are available at the following locations: Havana public library, Havana Nature Center, Dickson Mounds Museum, and Lewistown Public Library. Prizes will be awarded. Sponsored by the City of Lewistown, City of Havana, Forbes Biological Station, Havana Oktoberfest Committee, Illinois River Biological Station, Illinois River Road National Scenic Byway, Illinois State Museum-Dickson Mounds, Therkildsen Field Station at Emiquon, The Nature Conservancy, USFWS Illinois River Refuges Complex, Lewistown Chamber of Commerce, Spoon River Electric Coop, and Plum Hill Vacation Rental Properties. Activities and displays contributed by the Astoria High School's Environmental Club, Havana Park District, Emiquon Audubon, Mason County Arts Council, and the University of Illinois Extension's Master Gardeners and Master Naturalists.